Be the first to share your favorite memory, photo or story of Lonnie. This memorial page is dedicated for family, friends and future generations to celebrate the life of their loved one. La Grange-Lonnie McCoy Jones, 85, of La Grange, passed away Monday, November 12, 2018. Lonnie, the second of nine children, was born August 27, 1933, to the late William Perry Jones and Leona Jones. Lonnie served his country in the United States Army. Before leaving for service in 1953, he married Olive, the love of his life. Together they raised their five children and nurtured a long and loving marriage. Lonnie’s sense of humor kept his children laughing. You could always tell when he had something funny to say just by the look on his face. He loved to cut up with friends and family, and always enjoyed being silly. Never one to be idle, Lonnie was always hard at work. He learned very early on in life the value of a good day’s work and loved it so much that it became a hobby. He could be found welding or piddling out in his shop even years after his retirement. Lonnie had to have his own touch on every piece of equipment he owned. He would buy it, bring it home, tear it down, and put it back together his way. His family watched as he “Lonniefied” everything from trailers to grills. Although Lonnie would just soon be working, he enjoyed fishing and setting up nets in his spare time. He was a retired member of the Jason Volunteer Fire Department and served two terms as Fire Chief. Lonnie loved to worship his Savior and was a faithful member of La Grange Church of God. A graveside service to celebrate Lonnie’s life will be held Thursday, November 15, 2018 at 2 p.m. at Fairview Cemetery. 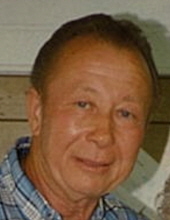 Lonnie is survived by his wife of 65 years, Olive Grady Jones; three children, Patricia Skinner and husband, Weylin, Ronnie McCoy Jones, and Thomas Wayne “Tom” Jones and wife, Lou; three grandchildren, Leigh Ann Jones, Miranda Lynn Jones, and Benjamin Wayne Jones; two great-grandchildren, Alexa McMillan and Miles Hanson; six siblings, Betty Jean West, Connie Sue West, Nellie Rose Burton, Carolyn Ann Smith, Kenneth Ray Jones, and Gary Lee Jones; and a special caregiver, Dorothy Jones. In addition to his parents, Lonnie was preceded in death by two children, Michael Allen Jones and Barbara Jean Jones; and a granddaughter, Kellie Marie Jones. Family and friends will be received Thursday following the graveside service. Online condolences may be expressed at www.rousefh.com. Memorials in Lonnie’s name may be made to La Grange Church of God, P.O. Box 218, La Grange, NC 28551. Arrangements are entrusted to Rouse Funeral Home, La Grange. To send flowers or a remembrance gift to the family of Lonnie McCoy Jones, please visit our Tribute Store. "Email Address" would like to share the life celebration of Lonnie McCoy Jones. Click on the "link" to go to share a favorite memory or leave a condolence message for the family.